This is "astronomy month" for me. I didn't mean for it to turn out that way. Sometimes these things just happen. Today I completed setup of a display inside a glass case in the lobby of Westlake's library. 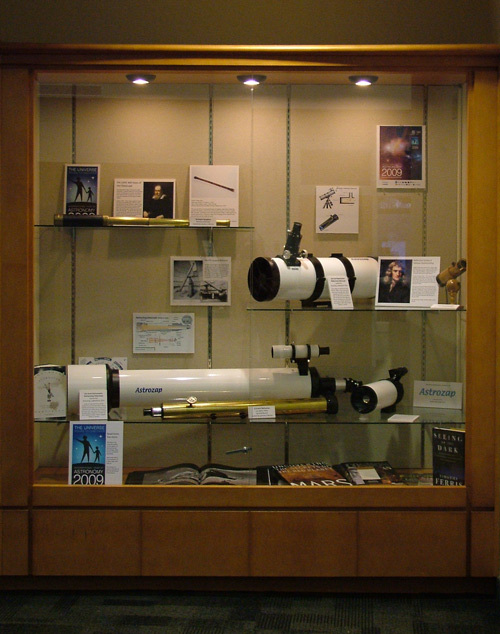 The display features modern telescopes loaned to me by Astrozap –a local company– and antique instruments from an astronomy club friend who is a collector and restorer. I created all of the signs and labels in the case and all of those books on the floor are mine! My only regret is that I couldn't get a banner or big sign to "title" the display. I think people will get the idea anyway. Oh yeah, "astronomy month"… so, there's the display case, then next week I do a public sidewalk astronomy event at that same library. On the 18th, I help commemorate the 70th anniversary of the college observatory, unveil a mural-sized astro-image granted to the observatory by NASA as part of the IYA finale, and offer early evening views of Jupiter — there's prep involved in those things, as well. Next, on the 21st, I'll be doing a presentation on The Pleiades at a metropark nature center with a brief star party to follow. Finally, on the 28th, it's back to the observatory where we'll be featuring views of the Moon through the grand old telescope — stunning viewing, actually! Whew. All that AND going to work every day. Yup, for me it's Astronomy Month! That is so awesome! Beautiful display. It's sort of amazing how very pretty telescopes are. Well done you! That's a great looking display case and it sounds as though you are going to have a busy month.